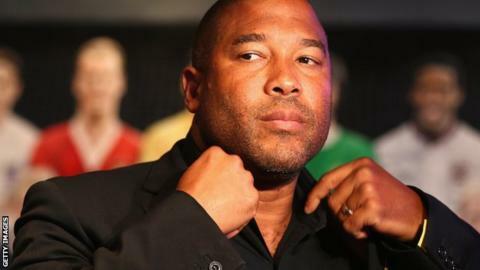 John Barnes says black managers don't get many second chances, while Viv Anderson, another former England international, thinks he will be dead before a black man is made boss of the England men's team. The statistics appear to give credence to both views, but that hasn't stopped a number of black coaches thinking big. "I want to be England manager," one tells BBC Sport. "It's a ridiculous dream, but how amazing would that be?" Another says he will "kick doors down" to progress, insisting the gloomy predictions of some will not put him off. "I know people who have given up, but I am stubborn," he adds. "I have sacrificed relationships and job opportunities already to get to this point." The issue of black and ethnic minority (BAME) coaches in football remains a live one. BBC Sport takes a closer look. QPR's Chris Ramsey is the only black manager in the English Premier League. Not long ago, there were none. But take a look lower down the footballing pyramid. Of the 230 clubs that make up the seven tiers of English football below the top flight, only 14 have black managers (6.09%). In the Women's Super League, there are two black managers among the 18 clubs: Sunderland's Carlton Fairweather (WSL 1) and Julian Broomes of London Bees (WSL 2). What about the rest of the United Kingdom? Well, there are no black managers in the top four divisions of Scottish football. Or in Northern Ireland's top flight. As for Wales, Airbus UK's Andy Preece is the only black manager in the country's elite league. The figures fluctuate all the time, but the situation has been a lot worse. A year ago, when Hughton lost his job at Norwich, the number of black managers in the top four divisions of English football was zero. To get a better steer of the current situation, it is worth comparing the number of black players with the number of black managers. About 25% of players in the Premier League and Football League are black. Based on current figures, about 6.5% of managers in the top four divisions - or six in 92 - are black. As for coaches, well, that's an even sorrier tale. A recent study claimed that of 552 key coaching jobs in English football, 19 were occupied by people from black and ethnic backgrounds. Football Association board member Heather Rabbatts said it was further evidence "that bodies across the game need to work together to challenge discrimination", while Sports Minister Helen Grant said the findings of a think tank were "appalling and worrying". Anderson thinks so. He says football has failed black managers in the 20 years since he was in charge of Barnsley. "I don't think we have changed at all," says the 58-year-old former Nottingham Forest, Arsenal, Manchester United and Sheffield Wednesday player. "There were two black managers - myself and Keith Alexander - and there's not much more now. "When there were two of us, there was talk at the time of it being the start of something, but it has never materialised." Hope Powell is one of the foremost black managers in British football. She coached the England women's team for 15 years and was tipped to make the switch to the men's game at one stage, with Grimsby Town reportedly a suitor. "It would be great, visually, to see more black people in the game, both male and female," she says. "It is disappointing there are not more." Former England and Liverpool winger Barnes claims he would have found another managerial job had he been white. The 51-year-old has managed Celtic and Jamaica but his last managerial job was with Tranmere Rovers in 2009. "A white manager loses his job and gets another job, he loses his job, he gets another job," he said recently. "Very few black managers can lose their job and get another job." That view resonates with Ramsey. Though he is currently in a job, he fears for his future should he lose it. He says "any manager of any race" struggles to find work but adds it is more difficult "as a black man". Former England striker Les Ferdinand, QPR's director of football, also believes "covert racism" still exists in football. Who are the "very few black managers" Barnes refers to who continue to get employment? Four come to mind. Hughton is in charge of Championship side Brighton & Hove Albion but has also managed Newcastle United, Birmingham City and Norwich City. He was also assistant boss for Tottenham and the Republic of Ireland. Sacked by Charlton in March 2014, former England left-back Powell was back in management with Huddersfield Town six months later. Curle is currently in charge of Carlisle United but has also managed Mansfield Town, Chester City, Torquay United and Notts County. And Paul Ince has managed Macclesfield Town, Milton Keynes Dons, Blackburn Rovers, Notts County and Blackpool. Good players but not good coaches? A pioneering black player with West Bromwich Albion in the late 1970s and early 1980s, Brendon Batson has devoted a large amount of time to anti-racism causes. Now a consultant to the Football Association on equality, he is heavily involved with a bursary programme seeking to get more black, Asian and ethnic minority coaches involved in the game. "More than 25% of professional footballers are black," says Batson. "What we have not seen is the transition. "The message, almost by default, has been 'we think you are good players, but we don't think you are good coaches'." That view is backed up by a recent study, carried out by The Sports People's Think Tank. It found that people from BAME backgrounds filled only 19 of the 552 'top' coaching positions at professional English clubs. Batson thinks so. He says that, "for the first time" in his experience, would-be black coaches and managers are being told they are wanted. "Now it is not about the old-boys network and who you know," says the 62-year-old, who was named an OBE in 2015 for his services to football. "It's a qualifications-based industry." Powell agrees. With more black players coming through, she believe there is an opportunity to "convert" those players into coaches. Acknowledging there is an issue with underrepresentation, the FA wants to drive up the numbers of BAME coaches. So what's the FA doing? By 2016, the FA wants 10% of coaches to be from BAME backgrounds at each stage of the qualification process. See table below. The Coach bursary programme, backed and facilitated by the FA, Premier League, Professional Footballers' Association and League Managers' Association, is helping achieve that goal. Now in its third year, it has funded 90% of coaching course fees for more than 100 male and female coaches from BAME backgrounds. In 2011, its inception year, 45 bursaries were offered. By 2015, that number had risen to 75. The FA expects the upward trend to continue. At least 10 candidates from year one of the scheme have secured roles at academies, centres of excellence and Premier League clubs. Batson says more would-be coaches from BAME backgrounds believe the FA's work can improve their chances of progressing in the game. "They recognise there is an opportunity to follow their dreams," he says. "All of those people here want to be career coaches." What about those that perhaps wonder what the point of doing a course is if they cannot find work? "That may have been the case even three or four years ago," says Batson. "I see that is changing now. " Geoff Pike, the FA's head of coaching awards, says "no-one has a crystal ball" but urges BAME coaches to give themselves the best chance. "If you are looking at the end and saying there is no chance, you will never have a chance," adds the former West Ham United player. Could the Rooney Rule work? To address the lack of black managers in the British game, there has been talk of adopting American football's Rooney Rule. Established in 2003, it stipulates that all National Football League clubs must interview a minimum of one BAME candidate for head coach and senior football vacancies. Former professionals Paul Davis and Jason Roberts believe the Rooney Rule would have a positive impact, with the latter claiming there is an "open resistance" to hiring black managers, but Anderson is sceptical. He agrees "everyone should be on the same playing field" but says chairmen and owners need to take a leading role. Hughton, in charge of his fourth professional club, hopes football can solve its problems without the need for the Rooney Rule. "If we can change that without legislation, that's the best way," he says. It's about building momentum, says Batson. "If you can't see anyone who looks like you, why would you invest in yourself," he says. But Anderson needs more convincing. "As we speak today, we won't see a black England manager in my lifetime," he says. "We have to break the mould, break the stereotype of black managers. Then who knows?" The European Cup winner hopes someone like Raheem Sterling or Danny Welbeck may want to give management a go when their playing careers are over. Raheem Sterling has won 14 England caps by the age of 20 - but could he ever manage his country? "Young black kids in east London have to see that if you dedicate yourself you achieve this, that and the other," adds Anderson. "Why can't they be the next England manager? "But you have to be given the opportunity. It was talked about 20 years ago, but it is about action, not talk. The time for talking is over." "If I have to kick doors down, that is what I will do." Click here to read the thoughts of three aspiring black coaches.